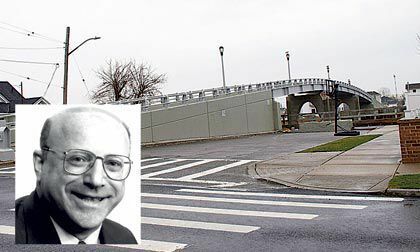 The City Council last Wednesday unanimously approved the renaming of a pedestrian span connecting Old Howard Beach to Hamilton Beach to the “Joel A. Miele, Sr. Pedestrian Bridge,” in honor of the former Community Board 10 Chairman and commissioner of two city agencies who died four years ago. Renaming the pedestrian bridge — located at 163rd Avenue and 99th Street over Hawtree Basin — was picked in honor of Miele because he lived near it and his son and widow still do, according to Braton. Miele was chairman of CB 10 from 1979 until 1990, at which time he was named a member of the city Planning Commission. Even after leaving the board, he attended many of the meetings as a concerned Howard Beach citizen, speaking on issues such as a proposed conversion of 99th Street — the block he lived on — into a one-way corridor back in 2001. In 1994, then-Mayor Giuliani named him the commissioner of the Department of Buildings and in 1996 shifted him to the Department of Environmental Protection. He was later appointed to serve on the Board of Standards and Appeals until he retired in 2005 and returned to his private practice on Furmanville Avenue in Middle Village with his son, Joel Jr. Joe passed away in May of 2013 at 78. On Sept. 29th at 11:00 am, the City of New York will be naming the pedestrian bridge over Hawtree Basin at 163 Avenue for Joel A. Miele, Sr. PE in recognition of his many years of service to the City of New York. There will be short ceremony at the intersection of 99th Street and 163rd Avenue.